An aquifer is an underground layer of water-bearing permeable rock or unconsolidated materials (gravel, sand, orsilt) from which groundwater can be usefully extracted using a water well. The study of water flow in aquifers and the characterization of aquifers is called hydrogeology. 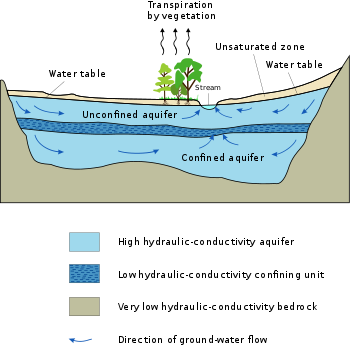 Related terms include aquitard, which is a bed of low permeability along an aquifer, and aquiclude (or aquifuge), which is a solid, impermeable area underlying or overlying an aquifer. If the impermeable area overlies the aquifer pressure could cause it to become a confined aquifer.